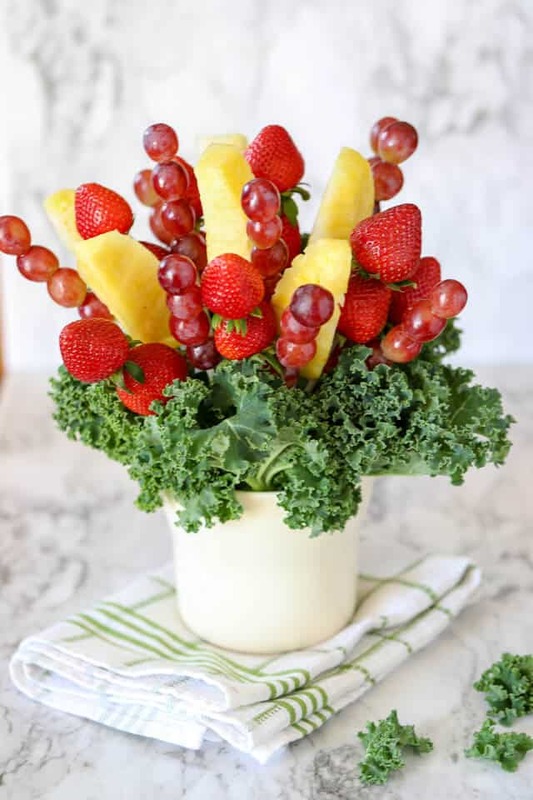 Make this fruit bouquet the centerpiece for your next party! It’s healthy, colorful, and festive! Assembling the bouquet takes very little time and costs far less than a flower or fruit arrangement delivery. 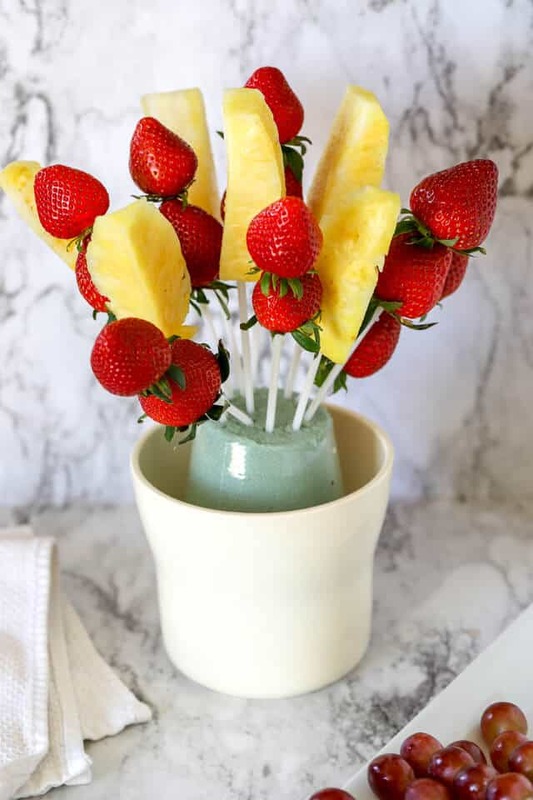 Fruit bouquet and edible fruit arrangements have become a popular business and, in my experience, are a lovely delivery to receive. 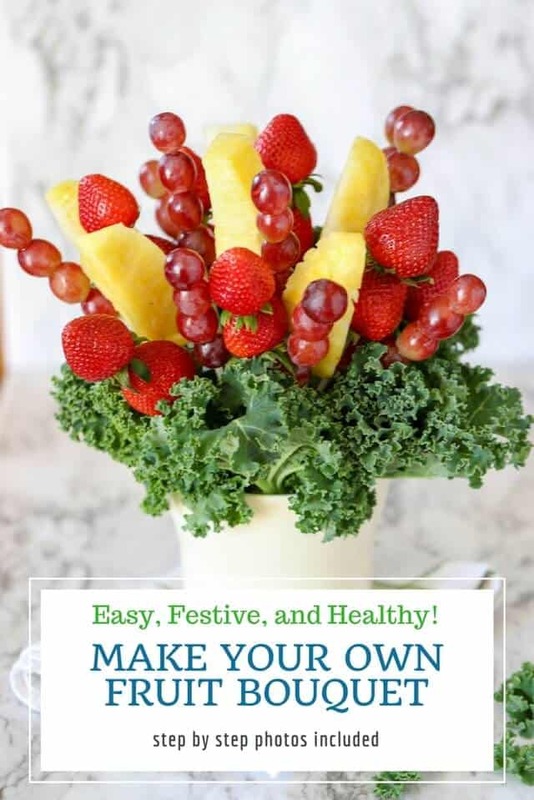 Why not pass along that happiness and fresh fruit to someone you know by making a DIY homemade fruit bouquet? Here’s how to make a fruit bouquet– it’s easy. The steps hardly need to be explained so the photos will do most of the talking. Choose a container. Fill it with floral styrofoam. 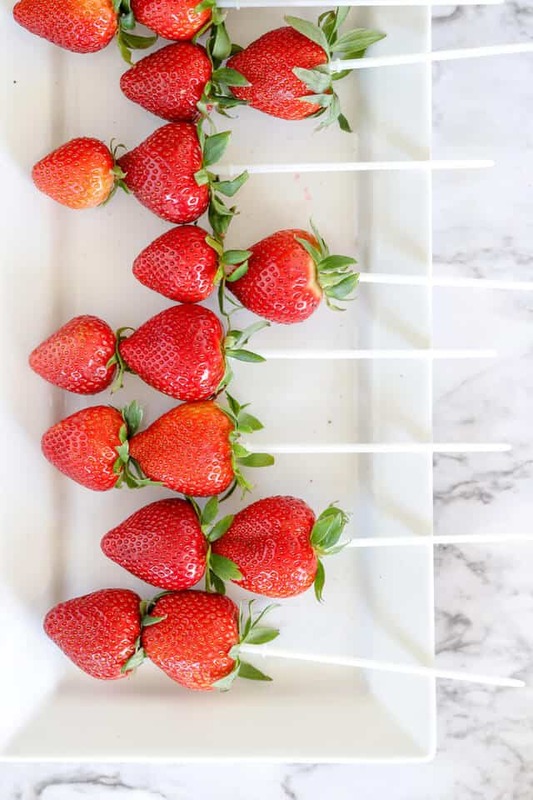 Cut your fruit and assemble the skewers. Carefully place each skewer into the foam. Fill in the edges with a leafy green. Start with a container that has a sturdy and level base. You don’t want the weight of the fruit to topple it later on. Use a heavy duty foam (often found in the florist department) and cut it, if necessary, to fit within your container. Try to wedge the foam into your container as tightly as possible. If it is shaky, your entire bouquet will be unbalanced. What fruit is in season for you? Any combination of fruit will work well. Strawberries, grapes, melon, pineapple are a good place to start. Place the fruit on the skewers. 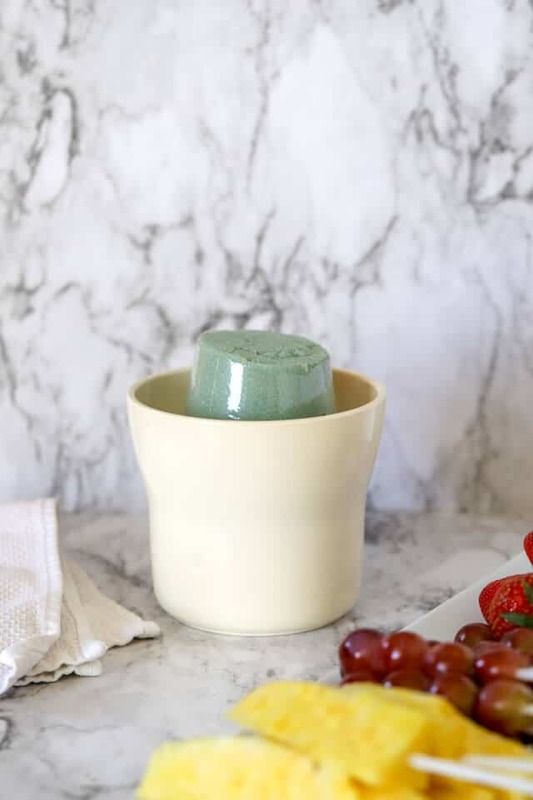 Strawberries and grapes are fast choices– no chopping or dicing here. Pineapples add a burst of color but you will need to slice your pineapple into spears. A note about the plastic skewers. I prefer the plastic sticks to the wooden sticks but both work. There are two types– the smooth plastic skewers and the notched plastic skewers. The smooth skewers are available online and in grocery stores. The smooth sticks work but you will find that some types of fruit slide down the skewer. 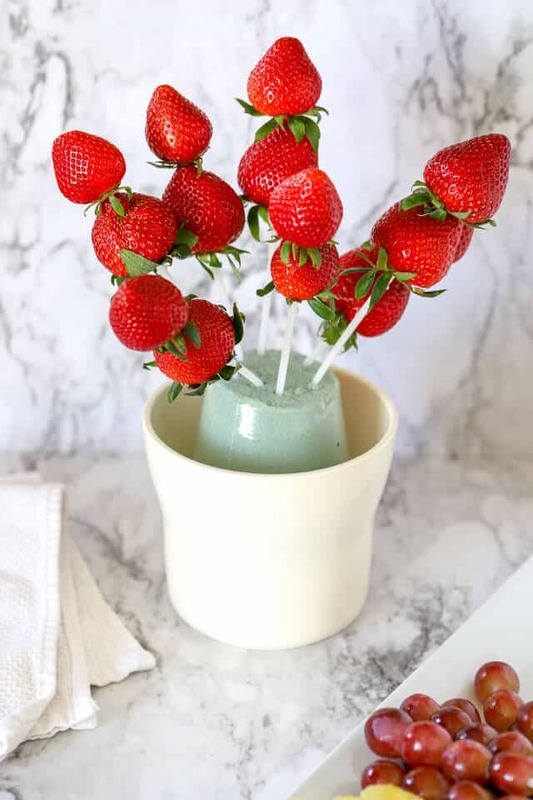 Adjust for this by filling the entire skewer top to bottom or just put the fruit partially on the skewer so that it doesn’t poke all the way through. I’ve looked all over stores and online and cannot find a place that sells the plastic sticks with these added notches. These are recycled from arrangements I’ve received as deliveries. Let me know what works best for you. Add one type of fruit at a time so that you can distribute it around the fruit bouquet. 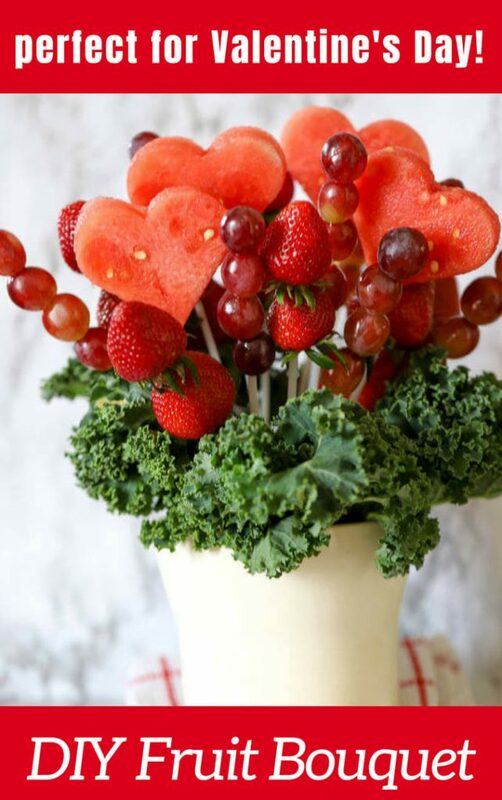 Think of this fruit bouquet in the same way as you would a floral bouquet. Balance is often achieved by mixing colors, shapes, and styles. Loading all of the grapes on one side and the rest of the fruit on the other likely isn’t the look you are going for. You can always window shop online on websites of companies that deliver similar arrangements to get an idea of what fruits and arrangements work well. Be as simple (one type of fruit but lots of it) or as complicated (many fruits added throughout) as you’d like. Learning how to make a fruit bouquet is a fun project for your kids too. Instead of the usual birthday cupcakes kids take into school, send your child with this fruit arrangement for a change. Or take the fruit into school in containers and let the kids assemble this together. Who says you can’t play with your food? The greenery filling is useful to add a contrasting color and to hide the skewers (mostly) from sight. Kale is an excellent choice, as are other lettuces, parsley or herbs. Stick to an edible addition here. Not that anyone is going to nibble on your kale (although they could!) but because a natural choice keeps with the edible theme of your fruit arrangement. 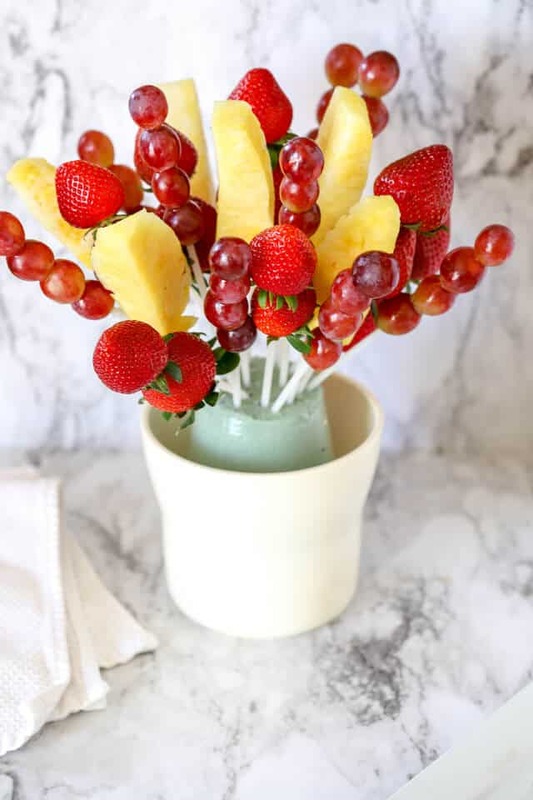 Pin this idea for how to make a fruit bouquet for later! 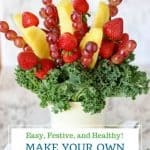 These simple and fresh fruit bouquets are wonderful gifts for birthdays, Mother’s Day, Father’s Day, Valentine’s Day, Teacher Appreciation Day, and also are a thoughtful gift in times of sending sympathy. I even like an edible arrangement on Christmas day. We eat so much heavy food over the holidays and a beautiful, fruit bouquet is a welcome change. 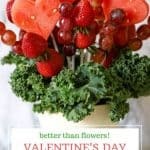 You can also learn how to make a fruit bouquet for Valentine’s Day– heart shaped everything!! Red strawberries, red watermelon, heart shaped melons, and more. This version of a Valentine’s arrangement focuses on the color red. 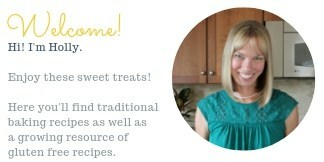 Try adding some chocolate covered strawberries too! Pin this idea for Valentine’s Day! Looking for more bouquet ideas? Try this one with cupcakes! And this fruit flower centerpiece! hi…i am also looking for these kind of skewers. If anybody knows where to get them, please let me know. Hi, this is gorgeous..where did you find the plastic skewers (The look a lot safer than the wooden skewers)… that’s the only item I’m missing… Thanks , GREAT JOB BTW!!!! I haven’t had any luck finding somewhere to buy the plastic skewers. I’ve been lucky to receive a few deliveries of fruit bouquets and have washed and saved those skewers. If you come across somewhere to buy more I’d love to learn more.